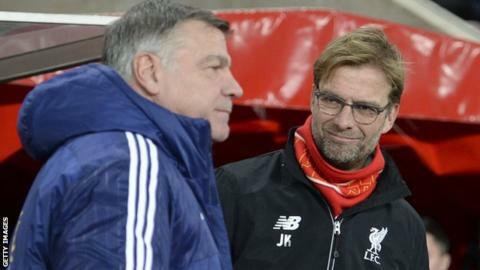 Liverpool boss Jurgen Klopp has played down Sunderland manager Sam Allardyce calling him a "soft German". Allardyce made the remark after Klopp said Sunderland's Jeremain Lens should have been sent off for a late tackle on Mamadou Sakho during Liverpool's 1-0 win at Sunderland on Wednesday. "It's not a problem," said Klopp. "A lot of people have said worse things about me. It's not the first time. "If you see the situation again then you know that I was not too wrong." Reds staff became involved in heated exchanges with their Black Cats counterparts on the sideline in the aftermath of the challenge. Lens was booked, while Sakho was able to finish the match. Klopp added: "So Mama is alive and everything is OK. That's all I want to say. But I had no arguments with the bench at Sunderland." Liverpool's win at the Stadium of Light lifted them up to seventh in the table, five points off a top-four spot. On Saturday they visit West Ham, whose co-owner David Sullivan revealed the club approached Klopp last summer about becoming their manager, before appointing Slaven Bilic. "In the summer, I was not available. I'm sure I should say not too much about this," said Klopp. "I'm lucky I had a lot of interest. West Ham is a good club but it was the wrong time, like all the clubs who approached me. "Everything is OK. The Hammers. More my second name than 'soft'."